Which is Cleaner, Coal or ICE? Are electric powered cars - like electric cars and plug-in hybrids - just as polluting as gas-guzzlers? I get this question a lot. "Plugging more cars into a power plant will result in the power plants creating more pollution. Which means that, although our city streets will have less pollution, the area around the power plants will grow worse until it's practically deadly. Haven't we just moved the dirt OUT of the city INTO the suburbs?" To help answer the "electric car pollution" question, I got the help of a friend, Steve Ewings, whose passion and expertise is in alternative and renewable energies. Many electric vehicle critics claim that charging thousands of electric powered cars from aging coal plants will increase greenhouse gases such as CO2 significantly. The overall mix of power plants in the U.S. is 55 percent coal, 9 percent natural gas, and 4 percent oil. The other 32 percent include nuclear power and renewable energy sources such as hydroelectric, solar, wind, and geothermal. However, although half the country uses coal-fired plants, electric powered cars recharging from these facilities are predicted to produce dramatically less CO2 than internal combustion engine (ICE) vehicles. According to the World Resources Institute, electric powered cars recharging from coal-fired plants will reduce CO2 emissions by at least 17 to 22 percent. Furthermore, in a study conducted by the Los Angeles Department of Water and Power,electric powered cars were significantly cleaner over the course of 100,000 miles than ICE cars. The electricity generation process produces less than 100 pounds of pollutants for electric cars compared to 3000 pounds for ICE vehicles. Because electric cars are significantly more efficient in converting their energy into mechanical power. 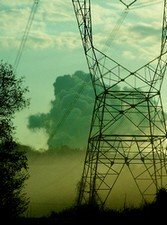 Even though there are emissions associated with coal- and oil-fired power plants, smokestack emissions associated with charging electric powered cars are extremely low, and in fact, electric powered cars can charge from zero emission sources such as nuclear, hydroelectric, solar, and wind power. For example, California has taken advantage of their abundant sunlight, and several utilities are using Solar Charge Ports to charge electric powered cars. Charge Ports are facilities that have an array of solar panels on the roof of the structure. The solar panels convert sunlight into electricity to power the cars or to feed the adjacent building's power supply. On cloudy days, the building supplies the electricity to charge the electric powered cars. Charge Ports are in operation in several cities in California including Diamond Bar, Azusa, and Santa Monica. Another point is that controlling emissions from several hundred power plants is much easier than controlling the emissions from 187 million internal combustion engine vehicles. Significant advances are being made in carbon capture and storage (CCS) for coal powered stations, and technology for capturing of CO2 is already commercially available for large CO2 emitters, such as power plants. Storage of CO2, on the other hand, is a relatively untried concept and as yet no power plant operates with a full carbon capture and storage system. However, the United States government has approved the construction of world's first CCS power plant, called FutureGen. A final point to consider: Whether "peak oil production" arrives with a bang or just sort of sneaks up on us, it is highly unlikely that ten years from now there is going to be enough liquid fuel to power all the world's cars, trucks, buses, planes, trains, and boats. We don't have a choice but to find a more efficient alternative. The only question is when.